We are actively engaged in providing effectual Silverline Gas Geyser. 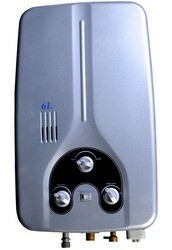 Our Silverline Gas Geyser is less power consuming and provides quick heating of the water. Loaded with ODS, the Silverline Gas Geyser is manufactured using high quality spare parts and steel. Available in White color, our Silverline Gas Geyser is compactly designed and easy to fit. Providing high-performing Home Appliances, we are one of the counted Silverline Gas Geyser Manufacturer and Supplier.